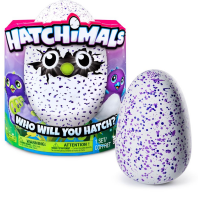 Hatchimals was one of the must have toys for Christmas 2016 which currently has no stock availability issues. We constantly track for stock which ensures you will be the first to know when availability is found. Recommended retail price £59.99. Hatchimals have arrived! With love and care, the egg will hatch to reveal an interactive magical creature. The must have toy for Christmas 2016. Where can I find Hatchimals stock? Use our unique stock listings to locate stock as soon as it becomes available at our panel of top UK retailers. Our servers are constantly checking for stock to ensure you are the first to know when availability is found. During busy periods Hatchimal stock can literally sell out in minutes, it is therefore crucial you know quickly when stock is available to buy before it sells out. We constantly check for Hatchimals stock, so you don't have to. Receive email alerts when Hatchimals online stock is found.